We rated and reviewed 13 of the best indoor cycles currently on the market. Our stationary bike and spin bike reviews consider the bike’s cost, feature-set, and durability. Yes, it’s true… cycling workouts are one of the best ways to get in shape. In fact, riding a stationary bike is one of the most efficient cardio workouts you can do. In terms of calories burned per hour, cycling is on par with jogging, running, and rowing, and just a little behind jumping rope. It’s just much more convenient. Fortunately, if you are like me and you prefer to workout at home, you can recreate the benefits that cycling workouts bring to the table. But to get the most out of your cycling, you need to have a quality machine. In this guide, I’ll go over the best spin bike reviews and the best indoor cycles for home use currently on the market. I’ve broken the guide down by price range so that you can get the best stationary bike for your needs. In fact, options like the Iron Fitness H-Class 510 and the Bladez Fitness Echelon GS are excellent budget-friendly choices. And, even the Fitleader FS1, which comes in under $300, is a great option for casual users. If you don’t have a huge budget, though, and you want a decent cycle you can exercise on, these are the best stationary spin bikes and indoor cycle bikes under $500. You can’t really go wrong with an adjustable seat, adjustable handlebar, and a 44 lb flywheel at this price. On top of that, the frame is made from heavy duty tubular steel, and there are transportation wheels on the front for easy mobility. An easy to access knob lets you control the flywheel resistance for a perfect workout experience. Sunny Fitness doesn’t mess around when it comes to quality, nor do they miss out on crucial features even on their cheapest models. The Sunny Health & Fitness SF-B1110 indoor exercise bike is equipped with a heavy-duty 44 lb flywheel that actually feels quite smooth and balanced compared to the other similarly priced budget exercise bikes. If you combine this heavy flywheel with the dial-based resistance system, you can get the perfect workout for your legs and hips, it can be as easy as you wish or as hard as you want to make it. The seat is height adjustable and can also move forward or backward, so both men and women of varying heights will find this bike comfy and easy to exercise on. The flywheel is connected to the pedals by a smooth, low-friction chain drive mechanism which doesn’t exactly classify as the quietest, but you should be fine as long as you snap on a pair of headphones while working out. The knob on the frame of the bike lets you set the resistance anywhere between low and super high. You can choose to emulate a leisurely ride on the road, or stress your body with the resistance cranked all the way up which is going to seem like trying to cycle up the slopes of a really steep hill. One of the things about this bike that could be really useful, especially to female users, is the adjustable handlebars. These can slide back and forth, as well as up and down, so you can easily grip them without having to uncomfortably lean forward while cycling. The gross weight of this machine is 118 lbs, and there’s a couple of transportation wheels on the front base stand so you can easily roll the machine away after finishing your workout. The maximum weight capacity is 265 lbs, and the bike measures 46.5″ long, 20.5″ wide, and 47.5″ tall. The Fitleader FS1 offers a dynamic flywheel, with perimeter shifted weight design that focus all the weight around the rims of the wheel to give a smoother, more natural cycling experience. The resistance is magnetic, and you can choose from 8 steps of flywheel resistance. Noise is kept low with the help a V-drive belt. While it certainly looks pretty radical and futuristic, the FS1 from Fitleader is, in reality, a very affordable compact spin bike that comes with high-end features. The flywheel is only 13.2 lbs in weight, but it is connected to a magnetic resistance system that really helps out with providing a smooth, yet challenging cycling experience. It actually feels like a real bike, even on the first level of resistance. The levels from 1-5 are meant for light exercise and cardiovascular work, while the levels 5-8 are actually designed for strength training and stand-up cycling. There is a V-belt drive system that connects the flywheel to the pedals, as a result, this machine operated very silently compared to a chain drive or mechanical resistance home spinning bike. The seats are 4-way adjustable, while the curved handlebars are only vertically adjustable. Four-way adjustment means that you can adjust the height as well as horizontal positioning (fore and aft movement). The steel frame is tough, yet lightweight at just 69 lbs, due to its unique X-like crossbar construction that saves space and provides structural rigidity. Maximum user weight is 293 lbs. There is an LCD display that shows speed, scan, time, distance, and calories. It can also display rotational speed in rpm, due to the built-in odometer. A hand pulse sensor on the foam padded handlebars lets you see your pulse on the LCD with the press of a button. There is a water bottle holder, and a tablet latch, although the console cannot be seen if you place a phone or tablet in the latch. The seat is well-cushioned and beneath it is a dual action safety brake mechanism. Warranty on the bike is 1-year, limited. The Bladez Fitness Fusion GS II fitness bike offers a felt-pad mechanical resistance which is dial-controlled, and a heavy 40 lb flywheel. The assembly is linked to the pedals with a chain drive that is surprisingly quieter than the chain drives we’ve seen in other mechanical resistance bikes. The body is built from steel, and there is a 4-way adjustable seat. There is nothing on this exercise bike that adds unnecessary weight or costs, yet it does not miss out on essential comfort features which augment the already fantastic cycling experience. The 40-lb flywheel is where all the action begins, it feels smooth and offers a nice cycling experience, one in which you do not feel like you are being assisted by gears or any other factors. The weight means that you have to overcome a bunch of inertia, in the beginning, this then translates into a continuous free flowing motion owing to the momentum obtained from the flywheel. Everything feels like a real outdoor bicycle. There is a felt pad resistance mechanism that you can control by turning a screw-driven dial which presses the pad onto the wheel to increase or decrease resistance. If you turn the knob all the way through to the high end, it feels as though someone just clamped 100 lb weights on each of your legs. If you have it set on medium, it is similar to cycling up a slope. The chain drive mechanism is definitely noisier than a belt drive but is still much quieter than the cheaper chain drives found on inferior brands or knock-offs. This bike is really comfortable to use, thanks to a 4-way adjustable seat which can be lifted, lowered, or pulled forward and backward. This means that everyone in the family can easily use this bike irrespective of height differences, without having to uncomfortably lean backward or forwards. Monitor your progress with an LCD exercise display that shows the important stats like rpm, speed, time, calories, etc. There is also a water bottle holder attached to the side of the frame, just on the top edge of the front fork. There are transportation wheels on the front to move this 85 lb bike around your home, and its maximum weight capacity is 275 lbs. There is a lifetime warranty on the frame, and a 1 year warranty on the parts. With a heavy-duty 40-lb perimeter weighted flywheel and an ultra-silent V-belt drive, the Echelon GS is a premium indoor exercise bike that scores high on performance and functionality. There is a dial based mechanical resistance system to emulate various cycling scenarios, and an LCD console to further accentuate the indoor cycling experience. While it doesn’t have a magnetic resistance system, the Ehcelon GS compensates for it with a heavy, perimeter weighted 40-lb flywheel that is chrome plated on the rims to ensure maximum durability and corrosion-free performance. The heavier flywheel helps increase smoothness and control, and you can take full advantage of the dial based resistance by using it to clamp down on the flywheel rim to simulate a challenging ride, such as a hill climb. The chrome rim decreases noise levels while braking, and keeps the weight focused around the edges to maintain a consistent motion that is identical to the rolling momentum of a speeding bike, so even if you stop applying pressure, the speeding 40-lb flywheel will carry your feet forward. The V-belt drive on this bike is designed to cut down on noise and makes the cycling experience much less jittery compared to a chain driven bike. There is a 4-way adjustable seat which can be adjusted to shift forward, backward, upward, as well as downward. The seat is rather hard and skimpy, like that of a real world racing bike. So if you feel uncomfortable, you can always replace it, just like you would replace a regular bicycle seat. The pedals are equipped with toe cages and are also fitted with adjustable nylon straps to keep your feet locked in position as you cycle. You may want to keep the straps on while reverse cycling to prevent your feet from slipping out of the pedals. There is an odometer built into this bike, and it feeds the data to an LCD console that is mounted right above the hooped handlebar. There are no heart rate monitors, unfortunately, but you can always buy one of your own, and strap it onto the handlebars. The LCD display shows time, rpm, speed, calories, scan, and distance. The handlebars are height adjustable, which could come in handy if you are looking to cycle in either an upright, or in a leaning-forward position. The machine weighs 110 lbs, and its maximum weight capacity is 275 lbs. There is a lifetime warranty on the frame, and a 1-year parts warranty. The Sunny Health & Fitness Commercial indoor spin bike sports a heavy-duty 48.5-pound flywheel. While this isn’t the best indoor training bike by any means, it’s relatively affordable price tag and its commercial design makes it an excellent option for anyone looking for a good deal. The Sunny Health & Fitness Commercial spin bike is very versatile and supports a variety of users with its slew of customizable features. The first thing that you notice is the heavy duty perimeter-weighted flywheel, which weighs 48.5-lbs to guarantee smooth, consistent cycling at all speeds. Then you have the easy to reach leather pad braking knob which lets you decrease or increase the flywheel resistance. It can be set to low in the case of casual users, or people recovering from injuries, or it can be set on high by those who want to truly challenge their strength and stamina. The seat is 4-way adjustable, and choosing the appropriate height adjustments allows people with heights ranging between 5′ to 6’4″ to comfortably use this bike. There is a chain drive system mated to a 3-piece crank to completely emulate the cycling experience that you would get on a real triathlon bike. The frame is oversized and made of tubular steel for maximum stability and rigidity. If you wish to change your riding posture, you can slide the multi-grip racing style handlebars forwards or backward to shorten or extend the reach. The handlebars can also be raised or lowered depending on your preferences. The bike supports both stand-up pedaling, as well as two-direction pedaling to work out all muscle groups in both your lower, as well as upper body. There is a water bottle holder located on the side of the front fork so you can access your drink while continuing to cycle. The onboard computer also calculates and displays distance, time, calories, scan, etc. Floor stabilizers are included on the base stands, along with front transportation wheels. The maximum user weight capacity is 300 lbs. There is a lifetime warranty on the frame, while the parts and electronics are covered by a one year limited warranty. The spin bikes in the $500-$1,000 range bring a little more to the table than the price range above. 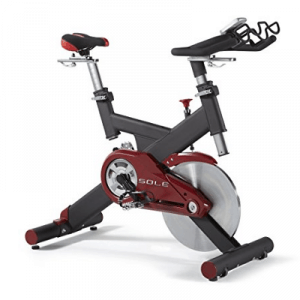 Your best options in this price range are the BodyCraft SPX Club, Fitness X Series Velocity, and Bladez Fitness Master GS… although, all of the options in this price range are solid. 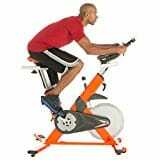 Ultimately, while these stationary exercise bikes aren’t quite on an elite level like the top spin bikes listed below, they are good enough for moderate-to-extreme riders. If you are looking for something more extreme, though, you might want to check out our stationary spin bike reviews on the options in the over $1,000 price range. But for those of you who are looking for an affordable exercise bike, the options below are perfect if you want to use a spin bike at home. Featuring an oversized frame made from tubular steel and a giant 40-lb flywheel, the ASUNA 4100 is loaded with plenty of stability and durability. Its heavy flywheel, coupled with the steel crank and chain drive mechanism makes every single workout session feel super smooth and natural. There are few companies that make affordable, yet high-quality products like Sunny does. And this time Sunny Fitness has rolled out a brand new indoor training bike for people who want a complete, exhausting, full body workout at home. This stationary bike is designed to provide you with the physical experience of riding a street bike, minus the wheels. So you will be doing all those miles inside your living room while watching TV. The chrome-rimmed perimeter-weighted flywheel weighs 40 lbs. and provides plenty of inertia and rotational momentum to keep you cycling smoothly and naturally. With the ASUNA 4100, you will never feel like the pedals are too light or jittery, thanks to the chain drive that is perfectly similar to the ones you use in a normal outdoor bike. Then, in case you wish to add some extra load on your legs, you can turn up the flywheel resistance by using the braking dial which progressively increases the artificial resistance from super low, to really high. You will need to stand up and pedal at max resistance, and the sturdy steel frame is designed exactly for that. It supports a maximum weight of 285 lbs. and is designed to last for ages, which is why there is a lifetime warranty on the frame. The pedals use SBD clips to accommodate cycling shoes and have toe cages for gym shoes. There is a water bottle holder located right next to the right front fork for easy hydration while cycling. All the sections on the multi-grip ergonomic handlebar are coated with a thick layer of foam for maximum comfort and a sweat-free grip. Both the handle as well as the contoured seat support 4-way adjustment. There are built in wheels on the front for easy mobility, and stabilizers on all four stand ends keep this machine locked in place on your carpet or floor. The warranty on parts lasts for one year. There is a console LCD display to show all important stats, including an odometer to record the rpm. However, this model lacks a heart rate sensor. The Bladez Master GS uses a heavy 45 lb flywheel and a powerful top-down resistance system to simulate the cycling experience of a real street bicycle. You can modify the positions of the fully adjustable handlebars and seats to get the riding position that you desire. There is also a console for monitoring performance, and displaying crucial exercise data as you exercise. The Bladez Fitness Master GS is built around the heavy 45-lb flywheel that serves as the core of this indoor bike. It provides the feel of a real street bike, with its inertia weighted design that provides the necessary resistance to your feet and also generates rotational momentum similar to that of a full-size outdoor bicycle. The faster you pedal, the more momentum you generate, and when you vary the resistance with the top-down lever, you realize that this stationary exercise bike is a lot more realistic in terms of actual resistance feedback and behavior, compared to any other mechanical resistance bike out there. The specially designed V-belt drive is virtually noiseless and provides an authentic, non-tampered cycling experience that only a true outdoor bike can replicate. When you decide to stand up on the pedals and go full throttle, there is absolutely zero wobble in the frame or pedals, which is a sign of true heavy-duty construction and a smooth drivetrain design. There are 4 leveler knobs beneath the floor stabilizer so that you can keep the bike steady on uneven surfaces or carpet. To adjust the seat or handlebars, all you need to do is loosen the cam bars, slide the seat or handle into your desired position (both are 4-way adjustable), and clamp the cam bars back into position. There are markings on the poles to make the adjustment process more intuitive and easy. The handlebars can be adjusted anywhere between 38.8″ and 45.7″ from the floor. The recommended height range for people willing to use this bike is- 5’3″ to 6’3″. The maximum user weight capacity is 300 lbs. The bike does come with an odometer and a LCD console for displaying exercise data, but there are no accessories such as a water bottle holder, or a heart rate monitor. There is a 5-year warranty on the frame, and a 1-year warranty on parts and electronics. The Spinner Sprint Premium is a home spinning bike built with commercial grade construction. Its inertia weighted flywheel is quite heavy at 43 lbs, and provides plenty of resistance as well as momentum. The Q-factor on this indoor training bike is 155 mm, which is actually comparable to most good road bikes. One of the most important things to consider before getting any exercise bike is its build quality. And the Spinner Sprint Premium Authentic is about as good as the build quality can get for a consumer spin bike with a monitor. Its entire body is designed with heavy gauge tubular steel (this bike weighs more than 120 lbs), and the inertia weighted, 43 lb chrome lined flywheel is the perfect example of what a good upright bike’s flywheel should be like. The crank is made from stainless steel and the entire chain drive assembly is enclosed within double steel fenders to minimize wear and tear, as well as cut down on noise. The braking system is leather-based and uses a top-down knob to adjust the intensity of braking pressure applied directly to the flywheel. You can easily vary the flywheel resistance while cycling and set it on low for a light cardio workout, on medium for a more intensive cardio, or on high for an all-out strength training session that will require you to stand up and throw all your weight on the pedals to move the flywheel. Pedals come with SPD straps on one side to accommodate cycling shoes and have toe cages on the other side for regular, gym shoes. This bike has a Q-factor of 155 mm, which is actually comparable to real outdoor street bicycles, and it is proof of the fact that the Spinner Premium delivers a natural, consistent workout that closely resembles the experience offered by an actual outdoor bike. In terms of accessories, there is a bottle holder on the main frame, but no LCD consoles are included with the machine. You can purchase an aftermarket LCD console and odometer, and attach it to the hoop bar. The handles on this stationary bike are only height adjustable, whereas the seat is 4-way adjustable for added versatility. The base stabilizers are made from non-slip plastic and the front stand is fitted with a couple of transportation wheels. This indoor bike has a maximum load capacity of this machine is 250 lbs. Warranty is 1-year, and does not include labor costs. Overall, is one of the best spin bikes under $1,000. With a unique shock suspension system built into the frame, the Fitnex X Series Velocity indoor bike sports a truly innovative and unconventional design. It also uses a 47 lb flywheel in conjunction with the V- belt driven flywheel to keep the machine running quietly and smoothly. Micro adjustable seats and handlebars keep this bike versatile and make it suitable for everyone. Normally, you don’t find indoor exercise bikes with a suspension system built in like the Fitnex X Series Velocity line of indoor bikes. There is a precision machined 47-lb stainless steel flywheel for maximum inertia and riding comfort, as well as balance and momentum. A special, long lasting brake design couple with this heavy flywheel generates plenty of resistance to do all sorts of exercises such as cardiovascular development, strength training, casual cycling, etc. The heavy duty shock suspension is perfect for helping out with hill climbing workouts when you have the resistance set to high. This stationary bike is designed to be used by a variety of people, and this includes people of varying heights. Which is why, the seats, as well as the handlebars, are micro adjustable, in a 4- way configuration (top, bottom, fore, and aft). The bike is built on a fairly compact 43″ long, 25″ wide, 34″ tall frame, and the whole thing weighs 120 lbs when fully assembled. There are easy transportation wheels on the front stabilizers to help with the relocation of this rather heavy spinning bike. Noise production is kept to a bare minimum by employing silent action V-belts in the drive system. The pedals are designed for high performance and come with both toe cages as well as SPD pads for total compatibility with all shoes. The pedals are spaced quite close together to deliver a super smooth and stress-free cycling experience that is similar to a real outdoor racing/touring bike. The seats are well padded and are supported by the gas piston spring shocks. A maximum user weigh of 300 lbs is supported by this bike, and it includes a 5 year warranty on the frame, and 2 year warranty on parts. With fully adjustable handlebars and seat, along with a blue backlit LCD console that displays all crucial info in one place, the Sole SB700 is a very efficient and highly versatile upright bike. The 48-lb chrome plated flywheel increases the smoothness of operation and delivers consistent, powerful momentum to the user’s legs. The Sole SB700 uses a space-saving crossbar style body and puts a whole bunch of high-performance parts into it that opens up a ton of possibilities in terms of workout plans and customization. 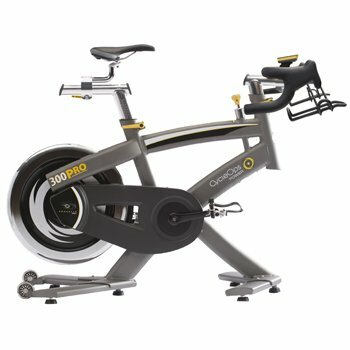 Starting from the 48 lb chrome lined flywheel, to the knob-driven adjustable resistance, everything works together perfectly to give you a unique spin bike experience. The heavier flywheel frees up your legs and encourages you to exert more force on the pedals until you build sufficient momentum to keep the wheel spinning. A super silent V-belt drive transfers the power from your legs into the wheels, and the whole drive assembly is covered by dual metal fenders to shield it from corrosion, damage, and to prevent any noise from escaping. The braking system in this upright exercise bike uses a kevlar pad as opposed to the leather and felt pads used by other indoor bikes. Kevlar increases grip and is extremely durable, so the resistance system does not wear down or loses its effectiveness over time. Just turn the dial to instantly adjust the amount of force you need to turn the flywheel, with each degree you make the flywheel seem heavier and more challenging to move. The pedals are equipped with both toe cages as well as SPD straps for total compatibility with all types of shoes. There is a backlit 3″ x 4″ console LCD that shows all the exercise data including calories, time, speed, rpm, etc. The seat, as well as the handlebar, can be adjusted in 4 different ways- up, down, fore, and aft. The machine is rather heavy at 140 lbs, which is why you will need those transportation wheels on the front to move it around. The maximum weight capacity is 300 lbs. All service is performed in-home, and the frame carries a lifetime warranty, while the parts and electronics are covered until 3 years. For those of you who are serious about your training and who have a big budget to ensure you get the best exercise bike possible, the options below will provide you with everything you need. The options in this price range are the cream of the crop. Of the indoor cycling bikes in this price range, the best options are the CycleOps 300 Pro, the Schwinn Fitness AC Performance Plus, the Keiser M3i, and the EVO CX Fitness Sway Frame Indoor Bike. The CycleOps 300 Pro indoor cycle is easily one of the better commercial spin bikes on the market, but it definitely carries the heftiest price tag. The EVO CX Fitness Sway Frame is the best option affordable option on this list, although at just under $1,500 it is still pretty expensive. Ultimately, there are plenty of elite options for you to choose between and the commercial spinning bikes below should help you make the best decision possible for your needs. Check out the indoor cycling bike reviews below to help you pick the option that is right for you. The Ironman Fitness Triathlon X-Class 510 has the most comfortable seat out of any indoor exercise bike. There are individual air chambers beneath each section of this Airsoft seat. The advanced exercise computer shows speed, rpm, distance, etc. on the LCD display, and a My Cloud Fitness 122 KHz chest belt is included with each bike. If you detest the skimpy, rock-hard seats that are found on most indoor spin bikes, you are going to love the Airsoft seats on this one. There are individual air pockets beneath each section of the seat to provide a comfortable platform on which you can exercise freely, without having to rise up and stand on the pedals every 10 minutes. The elevated racing bike handles come with built in foam-padded elbow rests just like in real touring and racing bikes, so that you can lean forward and rest your elbows on the handles while pedaling at cruising speed, or you can use these to train for the aero position. Both the seat, and the handlebar are 4-way adjustable, so you can lift them, lower them, or slide them forwards and backward according to your arm, torso, or leg length. The flywheel on this bike is quite heavy at 44 lb and is perimeter weighted for maximum inertia and balance, and it is connected to a specialized V-belt drive that is optimized to minimize noise levels and friction. An extra tough stainless steel 3-crank system prevents maintenance problems and keeps the drivetrain running at peak efficiency. The hybrid steel pedals are equipped with toe cages and are built to be tough enough for stand-up pedaling, which you will be doing in order to simulate hill climbing if you pump up the flywheel resistance from the dial. Both the pedals, as well as the drivetrain support two directional pedaling, so if you ever need to train in reverse mode, just strap your feet to the pedals and workout your muscles. The bike measures- 44” long, 26” wide, and 49” tall. The total weight of the fully assembled bike is 127 lbs, and it is equipped with floor stabilizers to keep it steady, even on carpets or uneven floors. The console shows speed, calories, time, rpm, etc. on the LCD panel, and you can use the free 122 KHz chest strap to get an accurate heart rate reading right on the LCD console. The maximum supported weight on this Ironman spin bike is 300 lbs. The warranty on the frame lasts for its entire lifetime, and the parts are covered by a 5-year warranty. The Kaiser M31 features a rear mounted wheel and a V-shaped body made from aluminum. The heavy rear flywheel is connected to the pedals through an automobile grade V-belt drive that’s virtually silent. Overall, the Keiser M3i is one of the best indoor cycles currently on the market. The Kaiser M3i utilizes a unique perimeter-weighted rear mounted flywheel that is designed to provide a uniform, continuous momentum throughout the cycling motion and it is connected to the pedals via a V-belt drive. This allows you exercise silently and without distracting any nearby family members/ roommates. There is a magnetic resistance system in the Kaiser which feels extremely well balanced at both the low and high ends in terms of resistance distribution. With both magnetic resistance and a belt drive, this is probably one of the quietest exercise bikes on the market. There is any to access dial which lets you progressively turn up the Eddy current braking effect, and with each degree of increment, the flywheel becomes slightly harder to turn. The whole bike is built extremely well from the stabilizers to the handle, and the most durable external parts of this whole assembly are the crank and pedal assembly. The crank is made from solid steel, coated with a black paint in order to protect the surface from stains and corrosion. The pedals are also made of metal, with a plastic and rubber finish for grip. There are both SPD straps as well as toe cages for compatibility with all shoe types. Then we come to the seat and handle- the two most understated and overlooked parts of any spin bike. In this bike, both are extremely comfortable- the seat is well padded and has a saddle like build with a wider base, and has a generous amount of cushioning on it. The handles are ergonomically curved and come with elbow rests ad hoops, just like the multi-grip handles that you find in aerodynamic racing bicycles. There are water bottle holders on either side of the handlebars, and a console on the tops completes the advanced accessory package. Apart from the usual stuff that you see on a LCD, this particular console comes with preloaded exercise programs and Bluetooth connectivity. There is even a built in tutor program that advises you about the most appropriate workouts for your physique, after analyzing your performance figures. The maximum load capacity is 300 lbs. Warranty on the frame is 10 years, and that on the parts is 2 years. The Schwinn Fitness AC Performance Plus utilizes an extremely durable, slip-resistant, low noise belt drive, which increases the overall smoothness and efficiency of this indoor spinning bike. Their aluminum frame is rustproof and much lighter to move around than a conventional steel frame, while the 6-magnet braking system offers smooth, maintenance-free resistance control. Schwinn’s new model, the AC Performance Plus, is all about maximum efficiency, and smooth, maintenance free operation. The first major component of this spin bike is the light, yet super tough aluminum frame. Schwinn has created an amazing bicycle frame that weighs just 112 lbs. but can support up to 300 lbs of weight on its seat. Also, it has a pretty low profile in the middle section so getting on and off the bike is super easy for everyone, tall (up to 6’8″) as well as short ( up to 4’11”). The seat sliders, handlebars, and hardware are all constructed high-quality aluminum and are extremely resistant to wear and tear, they are also totally rust proof. The next major component is the Carbon Blue belt drive. This belt functions like a traditional rubber V-belt but is reinforced with composite materials to greatly increase durability and reduce wear and tear over time. 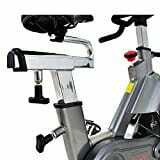 The flywheel on this stationary bike is totally perimeter weighted and the braking is provided by a series of 6 electromagnets that are controlled by an easy to access resistance control dial. With the magnetic resistance, you enjoy consistent and extra silent braking, and the resistance curve is almost completely linear. This lets you exercise more smoothly, and you can exert your muscles more effectively in order to turn the flywheel. The pedals on this bike are connected to solid aluminum cranks that are light and sturdy so your feet feel like they are flying through the air. You are moving the weight of the flywheel with your feet- nothing else. The pedals are equipped with SPD clips as well as toe cages, for maximum compatibility with all shoe types. The seat is 4-way adjustable, just like the ergonomic handlebar. There is no exercise console mounted on top of the bars, but aftermarket options can be easily purchased and clipped onto the frame of this bike. It does include any bottle holders either, which is surprising considering the price of this machine. The warranty on the frame is for 10 years, and is 2 years for the parts. Indoor cycling isn’t for everyone. However, if you’re looking for one of the most efficient ways to do cardiovascular training, especially if you want to minimize the impact on your joints, then perhaps there is no better workout than riding an indoor stationary bike. And, if you’re like me, and you like to workout at home, then your best bet is to buy a spinning bike for home use. Fortunately, there are a ton of different indoor cycling bikes available at all sorts of price ranges to meet your budget. So, if you’re looking for the best spin bike for home use, there should be an option above that will suit you. Hi, at the top of this page there is a photo of three spin bikes ! Can you tell me the make of bike ö the extreme right ? Thanking you, Shane .